Below is a comprehensive guide to golf betting, including a brief description of what golf betting is and why it is an extremely popular form of sports betting. There’s also a description of the most popular golf markets to bet on, and some of the lesser-known ones that offer decent value to punters. Following this, you’ll find an in-depth look at all the major golf tournaments, and the leading tournaments on the PGA Tour and European Tour. There’s also an insight into the best bookmakers to bet at when placing golf bets, followed by our favourite 5 golf betting tips. When choosing which bookmakers to place your golf bets with, you should consider a variety of things including competitive prices, places terms, the chance to cash out bets, special concessions, and, of course, whether they offer a welcome bonus to punters who open a new account. If you’re not already a Member of Ladbrokes, then their new player welcome bonus is certainly one you might want to consider, as you can claim a 100% Match Bonus on your first deposit of up to £200 – which could be ideal for betting on a golf tournament, as you can place it one selection, or a variety of selections. Ladbrokes also offer members the opportunity to fully cash out or partially cash out win-only golf bets. They are also very competitive on pricing, and you should find that many players in a golf tournament are the best-price or joint best price at Ladbrokes. William Hill are another bookmaker who are usually very competitive when it comes to pricing up players in golf tournaments, especially in high-profile tournaments like the US Masters, US Open, Open Championship and USPGA Championship. William Hill’s prices are always worth checking out, especially if you fancy players near the head of the market, as William Hill often adopt an approach of going top-price all the favourites to attract golf bettors to bet with them on these events. William Hill also offer new customers a small welcome package of £30 in Free Bets when you deposit just £10. 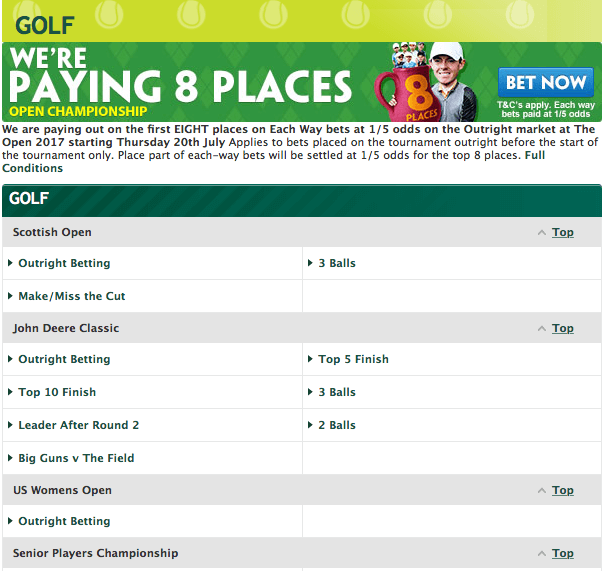 The leading Irish Bookmaker is a big fan of golf, and their special concessions deserve to be taken notice of. Sometimes in the past they have been brave enough to offer to give money back on all bets if a certain player, for example Rory McIlroy, wins the Open Championship – and, if they’re joint top-priced about a player, then placing your bet with them would be a bit of a no-brainer. Paddy Power also offer £20 in free bets to all new customers who deposit £10 or more. 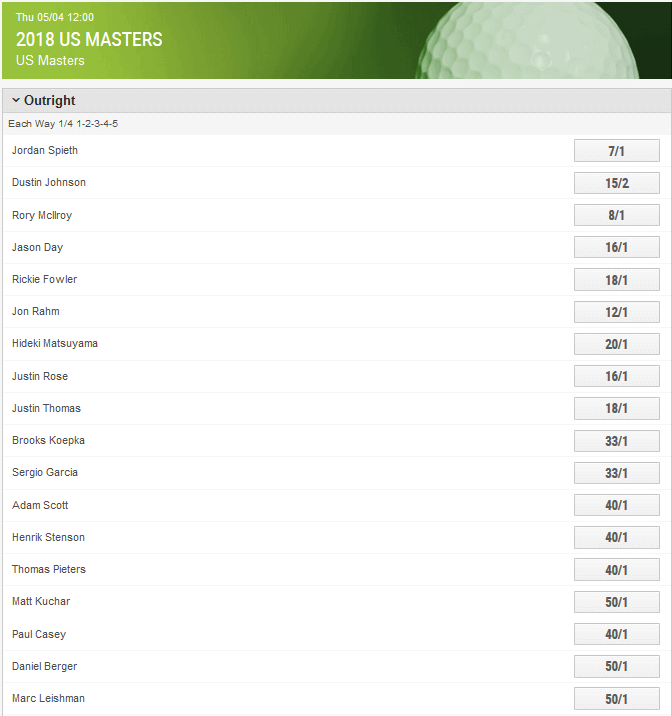 Paddy Power are also one of the few bookmakers who offer enhanced odds on a weekly basis on most PGA Tour and European Tour events, usually betting 1/5 odds 7 places. Fred Done, who is the managing director of Betfred, loves to offer competitive prices, and Betfred are always top-priced about several players in a golf tournament, and often go ¼ odds 6 places in many events, or even on more places in the majors. Where they are ultra-competitive though is in the less-used markets like top-10, top-20 and top nationality markets. Betfred also offer new customers a £30 free bet when you deposit £10. Golf betting is a form of gambling in which bettors try and predict the winner of golf betting markets that are offered by most leading bookmakers. Many of these golf betting markets focus on the world’s leading Professional Golf Tours, such as The European Tour, The PGA Tour and The Asian Tour. However, golf betting is also available on less well-known golf tours such as The LPGA Tour, The Challenge Tour, The Nationwide Tour, The Euro Pro Tour and The PGA Tour Champions. Golf betting is extremely popular with bettors who love to place bets at big-odds as, with an average of 156 players in traditional European Tour and PGA Tour Events, even the favourites are often priced-up at double-figure odds. Meanwhile, there are always well-known players at tasty prices like 25/1, 33/1 and 50/1, with lesser-known players going off at prices of up to 5,000/1. Those who take golf betting seriously or play golf themselves understand that, like in many other sports, form comes and goes, and part of the thrill of golf betting is trying to ascertain each player’s individual motivations, or spot when a player’s game is trending towards success. Golf Betting is also popular because you can get plenty of action for your money, with most tournaments taking place over 4-days, though there are also golf betting markets that provide opportunities for bets settled after just one round of golf. Some bookmakers offer unique markets for golf betting, but there are lots of golf betting markets that are available at the majority of bookmakers. The most popular markets are the Outright Markets, and these focus on picking the winner of a tournament, most of which are played over 4-days and 72-holes. You can have a straight win bet at the odds offered by the bookmakers, or you can place an each-way bet, with the most common place-terms being ¼ odds 1-2-3-4-5. However, some bookmakers offer enhanced place terms or alternative place terms, for example you can often get 1/5 odds 7 places on standard events, whilst some bookmakers have been known to offer ¼ odds 8 places on the Major Championships. However, picking the winner of the event is not the only way to bet on golf, and there are lots of other markets you can bet on. You can usually bet on a player to finish in the top-5, which means you win your bet if he finishes either first, second, third, fourth or fifth, whilst most bookmakers offer top-10 betting, and some even offer top-20 betting. You can often also bet on whether you think a player will or won’t make the 36-hole cut. The bookmakers also like to offer punters lots of novelty markets, and these usually include Top Nationality Markets and Group Betting. An example of a Top Nationality Market would be trying to pick the Top English Player. To win this bet, all your selection needs to do is finish in front of all the other English players in the tournament, regardless of what position he finishes in. Group Betting is similar in that the bookies will often group 5 or 6 players together who are similarly priced in the Outright Betting Markets, and offer odds on which player will finish with the best score, again regardless of where they finish in the tournament. Bookmakers are also aware that 4-days is too long for some bettors to wait for a bet to be settled, and two-ball, three-ball and match-betting is usually available on any given day. Golfers tend to be sent out in three-balls on the first two-days of a tournament, and in two-balls on the last two-days of a tournament, and bookmakers will usually offer odds on which players will shoot the lowest score in those groups. Meanwhile, match-betting is when bookmakers price-up two players who are not playing against each other in a straight match-bet, and you can bet on which of those players you think will card the lowest score. 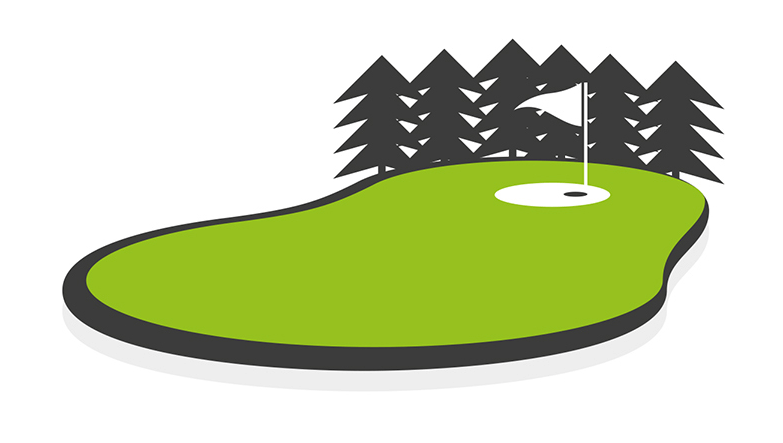 You can even bet on whether there will be a hole-in-one during a golf tournament – and it happens more often than you might think. The Professional Men’s game has four Major Tournaments, with the first major of the year being the US Masters in April. This is then followed by the US Open in June, the Open Championship in July, and the USPGA Championship in August. The US Masters is the only one of the four majors that is always played at the same golf course, which is the Augusta National. Meanwhile, The US Open, The Open Championship and The USPGA championship are played on a variety of courses that are chosen several years in advance. More recently, the US Open has started to use some of the best new golf courses in America. 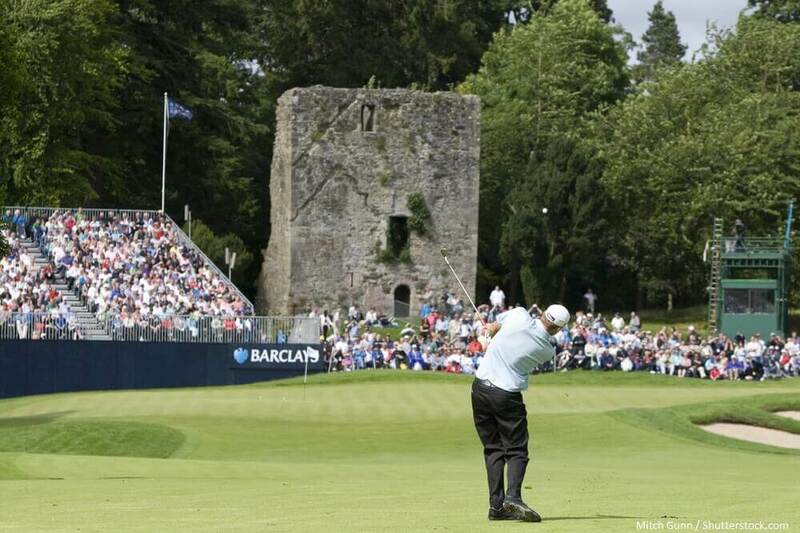 Both the PGA Tour and the European Tour also have flagship events, sometimes called the fifth majors due to their high-profiles, lucrative prize funds, and the amount of world ranking points at stake. On the PGA Tour this is The Players Championship, which is annually held at Sawgrass. Meanwhile, the European Tour’s flagship event is the BMW Championship which is annually held at Wentworth. There are also four WGC Events, which are the WGC HSBC Champions, WGC Mexico Championships, WGC Dell Technologies Match Play, and the WGC Bridgestone Invitational. The PGA Tour Season actually starts in October with the Safeway Open, with the other PGA Tour Events including The CIMB Classic, Sanderson Farms Championship, Shiners Hospital For Children Open, OHL Classic, RSM Classic, IPH HANDA World Cup Of Golf, Hero World Championship, Franklin Templeton Shootout, SBS Tournament of Champions, Sony Open, CareerBuilder Challenge, Farmers Insurance Open, Waste management Phoenix Open, AT & T Pebble Beach Pro Am, Genesis Open, The Honda Classic, Valspar Championship, Arnold Palmer Invitational, Puerto Rico Open, Shell Houston open, RBC Heritage, Valero Texas Open, Zurich Classic, Wells Fargo Championship, AT & T Byron Nelson, The Memorial Tournament, FedEx St Jude Classic, CVS Health Charity Classic, Travellers Championship, Quicken Loan National, The Greenbrier Classic, John Deere Classic, Barbasol Championship, RBC Canadian Open, Barracuda Championship, Wyndham Championship, The Northern Trust, The Dell Technologies Championship and The Tour Championship. The last four events also form The FedEx Cup Play-Offs, with the winner getting a $10,000,000 Bonus. Meanwhile, to challenge the pulling-power of the FedEx Cup, the European Tour has launched a new initiative in 2017 – The Rolex Series, an 8-event series sponsored by arguably the world’s finest watch-maker. The 8 events that make up the series are The BMW Championship, Open de France, Irish Open, Scottish Open, Italian open, Turkish Airlines Open, and the DP World Tour Championship. The two other major golf competitions that golf bettors can’t get enough of are The Ryder Cup and the President’s Cup. The Ryder Cup is a match between Team USA and Team Europe, which is played every two years. Meanwhile, the President’s Cup is a match between America and The Rest Of The World, which is also held biennially in the years that the Ryder Cup is not being played. 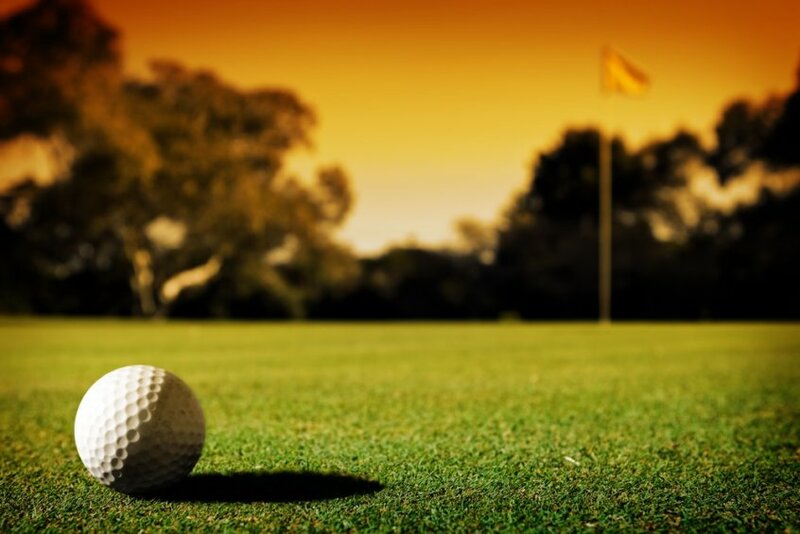 Golf Betting requires patience, mainly because you’re usually trying to pick the winner of a tournament with over a hundred players in it – and not even the best golf tipsters in the world can win every week. However, if you’ve got a good eye for players coming into form, or for spotting the next big stars amongst the constant influx of youngsters that seem to be dominating world golf more and more – then there’s a good chance you’ll be betting on players who are priced-up at odds that represent value in the markets. Finding one or two big-priced winners over a season will usually mean you make a profit and, of course, you’ll have plenty of fun watching one of the world’s most popular sports. If you’ve ever bet on horse racing in the UK, where the racecourses vary greatly, you’ve probably heard of the saying “Horses For Courses“. It basically means that some horses are better around a certain type of course – and it’s very similar with golfers. Some golf courses just suit the eye of certain golfers, and it is often to do with which way the ball needs to be shaped off the tee to maximise a player’s chance of getting a birdie. Some golfers are also better in certain conditions. 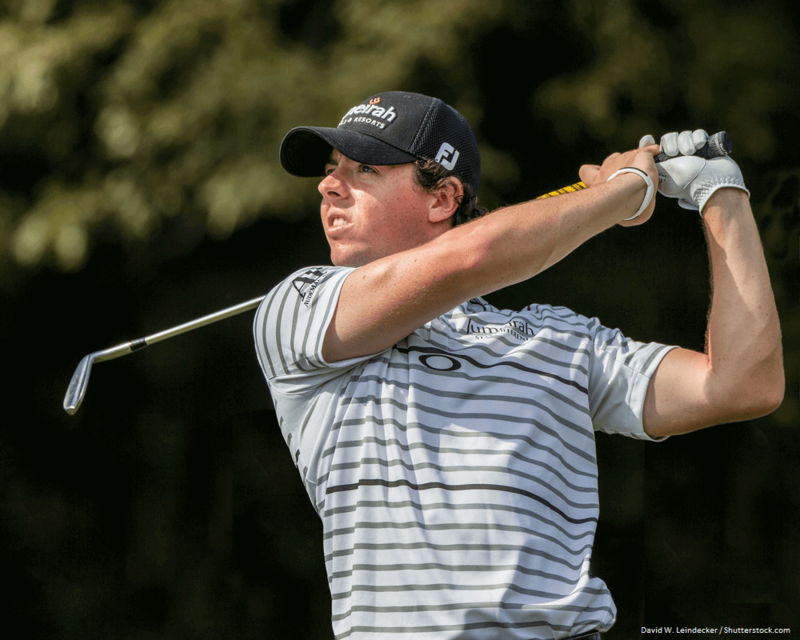 For example, Rory McIlroy is better on courses where the terrain has been softened by rain, allowing him to play what is often referred to as “Target Golf”, meaning your ball stops pretty much where it lands. The flip-side of that is some golfers are excellent at controlling their ball in hard and fast conditions, where the margins for error are less due to the ball bouncing and running when it lands. Putting can also be a big-leveller and, when greens are in great condition, the best putters usually make the most of conditions, whereas bumpy greens can be a great leveller. Knowing the strengths and weaknesses of each player can be a great asset when it comes to finalising your bets for a tournament, so make sure you know your horses for courses by checking past results, or following a tipster who does all that hard work for you. Just because a golfer should play well around a certain golf course, doesn’t always mean he will. Sometimes that is because he is not on his game, but sometimes it also boils down to a lack of motivation. Golfers that have only just got their playing rights for either PGA Tour or Europea Tour will be keen to make their mark early, as they must amass a certain amount of prize money to keep their card for the following season, or win an event which guarantees their playing rights for at least two years. Playing well and winning also earns players valuable ranking points, and being ranked in the top-100 players in the world will get you into big events. Meanwhile, Top-50 Status gets players into the Open Championship and the US Masters. However, once players achieve certain goals, they may take their foot of the gas for a while before trying to peak again for the lucrative end-of-season events like The FedEx Cup or The Rolex Series. Many bookmakers now offer the option of cashing-out win-only golf bets, and knowing your courses can help you make inspired decisions about whether to cash-out your bets. For example, if your player needs to birdie the last hole to win, and you know it’s an easy par-5 that most players have been birdieing – then you may decide to let it run. However, if the last is a difficult par-4 that traditionally averages over par, then you can make an informed decision to cash-out, guaranteeing some profit. One of the main mistakes that golf bettors make is betting with their heart rather than their head. Tiger Woods continued to be priced-up at ludicrously short-odds long after he was past his expiry-date, and crowd-favourites like Ernie Els and Phil Mickleson tend to be priced-up on their past exploits rather than their inferior current form. Therefore, the value usually lies in the yet unfulfilled potential of young players rather than the fading talents of yesterday’s heroes (But don’t hate me if one of the old-dogs manages to pull a win out of the dying embers of his career).